even on TV had a "TV Title", but regardless, he wore it with pride. The first time I watched him wrestle live was in 1996 or '97 in front of a massive crowd of about 25 people down at the local Little League field. And if it hadn't had been for us guys from school there to see our classmate, there would've been about 7 people there... counting the other wrestlers. Watching him then I knew he was far more talented than any of the other wrestlers around here, but it had never really crossed my mind that he could some day make the "big time". Besides, even if he was the most talented wrestler on Earth, how could a guy from deep in the hills of Southern WV get his foot in the door of one of the major organizations? So, naturally when I heard him say that he was going to one day be the WCW Cruiserweight Champion, I had a tendancy to dismiss it as nothing more than a wild dream. Well, I guess dreams really can come true. After he graduated, I never heard anything else from Doodle until around 1998-99 when pictures of him competing on the Florida indie scene surfaced on the internet. It wasn't too long after that when the local newspaper reported that he had signed a 3 year deal with WCW. I didn't know if that meant he would ever get any TV time or not, but sure enough "Jamie Howard" began popping up on WCW's Saturday Night show. From there it was a stint under a mask as one-third of the Jung Dragons, some time in the WWF's developmental system after the WCW buyout, and eventually to the 2002 King of the Ring where he defeated Hurricane Helms for the Cruiserweight belt, just like he said he would some 5 or 6 years ago. 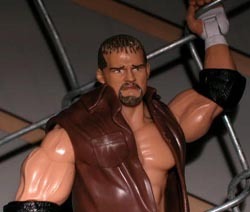 I ran into Jamie Noble during his time home for Christmas and he, of course, seemed very happy with the way things have went in his career. I really get a kick out of his character and yes, people really do talk that way around here. 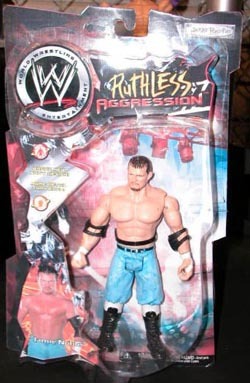 Who would've thought he would go from battling the likes of "Psycho" and "The Cuban Assassians" in Little League parks and Fire Departments to having his action figure hang on the same racks as Hulk Hogan, Ric Flair, and Shawn Michaels down at Wal-Mart. Go figure!....no pun intended. WCW for NES--Beware the WCW Master!